Ordered in May 2010, the 42.5m superyacht Hemisphere 140 (hull no. 85) was launched in early July by MCP Yachts, and christened Raffaella II. The Hemisphere 140 becomes the largest semi-displacement all-aluminium yacht to be built in South America to date, and the new flagship of the Brazilian yard. Designed by the in-house team, her naval architecture was developed in cooperation with Vripack. The interior, also from the in-house team, accommodates 10 guests in five cabins: a full-beam master suite on the main deck and four double cabins on the lower deck. Lloyd's registered and MCA compliant, the Hemisphere 140 is powered by twin 1,825 hp Caterpillar C-32 engines giving a top speed of 19 knots, a cruising speed of 15 knots and a range exceeding 4,000 nautical miles. The Hemisphere 140 will be delivered before the end of the summer. 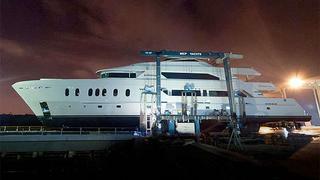 Also, MCP is currently building a modern 30.5m motor yacht called MCP 100 LE, scheduled for a launch in 2014.